Display problem on some sites (even Opera blogs). Have you tried with extensions disabled? Yes I did, but problem not solved. 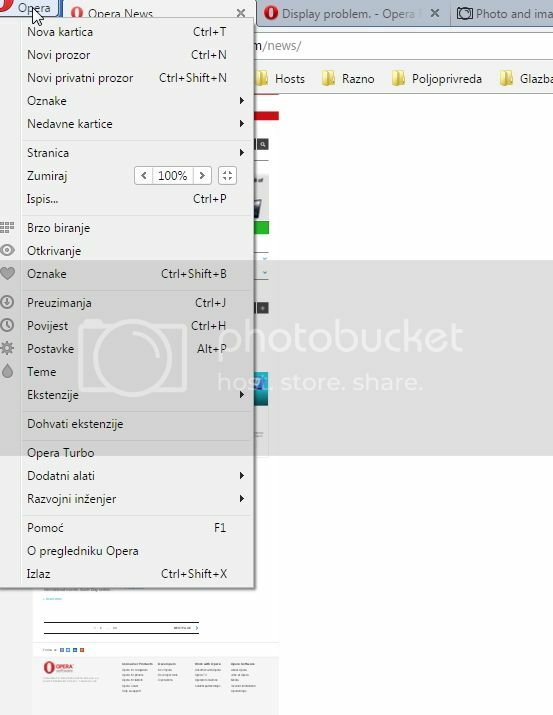 Click in the Opera menu and check what your zoom is set for. I think it might be turned down to 25% or something. Okay. Look at the full URL of the website you are going to. Is it the mobile version of the website? Try viewing it in a private window. I had this exact same problem in Chrome. I finally reinstalled Chrome. But Chrome crashes at random intervals, so I figured, eh, I'll see if Opera's any better these days. And I'm hitting this. Both in Chrome, and Opera, you can force a given page to be 'normal' by going into Developer tools, enabling emulation, and then, unchecking anything checked, or, if nothing's checked, checking something (like, "Enable Emulation") and then unchecking. It's annoying as hell. It happens on any site; in my case, reddit, as I type this (which is why I came here, to see if there's a solution.). This isn't a zoom issue, there aren't any extensions or plugins installed. Tried turning Opera Turbo on and off, etc. Opera isn't sending headers to the site saying its a mobile (I looked, with just the network tool, didn't bother looking Fiddler). So, for some reason Opera (and Chrome) get stuck in a mode where it thinks its a mobile. Maybe its an underlying webkit/blink issue. It's pretty infuriating. By developers tool I found out what's problem. The problem is in pages which contain "meta name="viewport" content="width=device-width" " code in head. After change to "meta name="viewport" content="width=device-width initial-scale=1.0, maximum-scale=1.0, minimum-scale=1.0, user-scalable=no" " everything is OK.
For me that flag is disabled by default.